As yesterday was the 140th running of the Kentucky Derby, it seemed an auspicious time to revive the blog after an eleven moth hiatus, and what else could one comment on that the venerable Mint Julep. Doubtless you are thinking that quite enough on this subject has already been written. Well, you got me there, but I am going to plow ahead anyway. First, just a bit of history compliments of David Wondrich‘s Imbibe. Apparently juleps date back to around 900 a.d. as floral or herbal infusions with sugar taken as medicine, as state that it stayed until about the end of the American Revolution when it takes on it’s more genial role, curiously as a morning drink. By 1802 the mint was added, though to primarily a brandy drink. For much of the 19th century it was the most popular drink the country. It’s fortunes faded until in 1938, Churchill Downes started serving them at the Derby. Today it, or an abomination of it, is the official drink of the Kentucky Derby, and I quote “The Early Times Mint Julep Ready-to-Serve Cocktail has been “The Official Mint Julep of the Kentucky Derby” for more than 18 years.” Ready-to-Serve Cocktail?!? While great for entertainment purposes, there is a wee flaw. He obliterates the mint. Sure, he uses a muddler to do it, but mint reduced to that much of a puree releases astringent flavors as well. Also, unless you strain the final cocktail before putting it over ice, you end up with tiny minced mint bits in your teeth. Nope. I think we will have to go with David Wondrich’s recipe from Esquire. Chill an old fashioned glass, either by leaving it in the freezer or by putting ice water in it for a few minutes. Place the mint leaves and sugar in the bottom of the glass. Muddle for a few seconds until the sugar is worked into the mint leaves, but the leaves are still intact. Add a splash of water or seltzer and stir. Add crushed ice to fill the glass. Add the bourbon. Stir until ice starts to form on the outside of the glass (15-20 seconds). 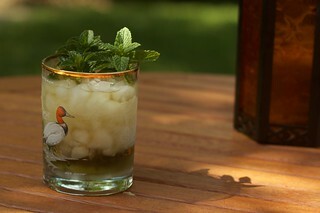 Top up with fresh crushed ice and garnish with a sprig of mint. As to what bourbon to use, opinions vary. Markers Mark is always a popular choice in the bluegrass. My father-in-law and I have always been partial to Old Crow, which is a bit of a hidden gem and popular with several of my more ardent bourbon drinking friends during my sojourn in Kentucky. A fellow by the name Samuel Clemens was partial to it too, though that was a while ago. It’s certainly a refreshing drink on a warm afternoon. Be warned that it does tend to engender the urge to sing “My Old Kentucky Home” though.